Humble Oilfield. Courtesy of the City of Humble. Image available on the Internet and included in accordance with Title 17 U.S.C. Section 107. Majestic Theater Interior. Image available on the Internet and included in accordance with Title 17 U.S.C. Section 107. Niels Esperson Building. Image available on the Internet and included in accordance with Title 17 U.S.C. Section 107. Mellie Esperson Building. Image available on the Internet and included in accordance with Title 17 U.S.C. Section 107. Mellie Esperson overseeing the construction of her buildings. Image available on the Internet and included in accordance with Title 17 U.S.C. Section 107. ESPERSON, MELLIE KEENAN (ca. 1870–1945). Mellie Keenan Esperson, businesswoman and developer, was born in Manhattan, Kansas, around 1870, the daughter of Thomas and Hannah Marie (McFarland) Keenan. She moved to Oklahoma with her mother and stepfather, John Brown, as a young woman. While living there she met Niels Esperson, a native of Denmark who had become involved in real estate and other business dealings in Oklahoma. The couple were married in El Reno, Oklahoma, on December 20, 1893, and subsequently lived in Colorado and Kansas, where Niels pursued mining work and oil deals with limited success. In 1903 they moved to Houston, where Mellie learned the intricate dealings of the oil business while her husband became a pioneer developer of the Humble oilfield. Over the next decade the Espersons diversified their interests in Houston into real estate and other business efforts. When Niels Esperson died in 1922, he left his wife substantial commercial wealth, including an oil-rich ranch in Liberty County, interest in the Reed Roller Bit Company in Houston, and large holdings in a tile plant in Kansas. Her first project was to construct the Majestic Theater. The theater, designed by Chicago architect John Eberson, opened in 1923 as film venue. It stood for almost fifty years before being demolished in 1971. In 1924 Esperson initiated plans for an office building that her husband had envisioned for property he owned in downtown Houston. He had left no specific instructions for the building, so she traveled to Europe to gather ideas on materials and then again turned to architect Eberson to design what she intended as a memorial to her husband. 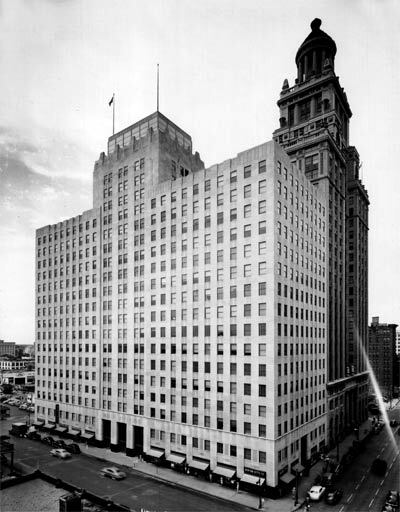 The thirty-two story Niels Esperson Building at the corner of Travis and Rusk Avenue opened in 1927, the tallest structure in Texas at that time. The Italian Renaissance building features a gold-leaf tower topped by an elaborate six-story tiered monument. Inside, terra cotta urns, bronze elevator doors, arabesque obelisks, and extensive use of imported Roman marble convey the ornate sense that Esperson wanted. When completed the building reflected her forward-looking style, with an exercise area and adjacent parking garage included in its design. She had the structure air-conditioned in 1938. Fourteen years after this building opened, Mellie Esperson turned to John Eberson and his brother Drew to design an adjoining structure. The Mellie Esperson Building on Walker Avenue was completed in 1941, a nineteen-story structure similar in style to its larger neighbor. The building bearing her name, which is separate from the first structure but adjoins it on most floors, was distinguished at its opening for being the largest office structure constructed in Houston during the Great Depression and the first skyscraper in Houston to be built with central air-conditioning. The Esperson buildings remain a significant landmark in downtown Houston, where they provide offices for banks, oil companies, and other professional interests. Apart from her downtown construction projects, Esperson planned and developed the Niels Esperson Industrial District and remained active in the oil business as a prospector and producer. She also acquired numerous substantial real estate holdings in Houston. The Houston Ship Channel, the development of which she supported, at one time crossed her property in four places. Her Liberty County interests included not only oil but rice farms. For some twenty years she oversaw all of these efforts from her suite of offices on the twenty-fifth floor of the Niels Esperson Building, taking great pride in her business judgment and ability to use wealth wisely. She was an active member of the Houston Chamber of Commerce and routinely made donations to the Museum of Fine Arts. She was also a large contributor to the Little Theatre and the Houston Symphony. During World War II she donated office space for the local draft board and the Soldiers Service Bureau. She was a Christian Scientist and left her church in Houston a large cash bequest. She was also a member of the Business and Professional Women's club, the Downtown club, the French Club, and the city Federation of Women's Clubs. Mellie Esperson in later life. Image available on the Internet and included in accordance with Title 17 U.S.C. Section 107. In 1925 Mellie Esperson married Harry Ewing Stewart, a man some twenty years her junior, who subsequently established the Stewart Company, which in 1961 was considered the largest distributor of farm and industrial equipment in the United States. The couple were divorced in 1934. Esperson received much recognition for her visionary business sense and good spirit, including an award in the 1930s from the Women's Advertising Club of Houston as the city's most successful businesswoman. In her later years she continued her business work even after losing her eyesight. She died in Houston on January 14, 1945, and was buried there in Forest Park Cemetery. The Espersons had no children; she was survived by her sister and numerous nieces and nephews. Encyclopedia of American Biography. Houston Metropolitan Research Center Files, Houston Public Library. Houston Post, January 15, 16, 1945. Handbook of Texas Online, Debbie Mauldin Cottrell, "ESPERSON, MELLIE KEENAN," accessed April 19, 2019, http://www.tshaonline.org/handbook/online/articles/fes25.